ER Editor: Readers may also be interested in the Breitbart report of 2 days ago showing the Chemnitz protests, titled PICTURES: Protesters Stage ‘Mourning March’ in Chemnitz for Victims of Killer Migrants. The German government is struggling to contain a wave of violence that has rocked the country since Europe’s refugee crisis began just over three years ago, when Chancellor Angela Merkel first announced her “open doors” policy in response to a wave of refugees fleeing Syria, Afghanistan and North Africa. 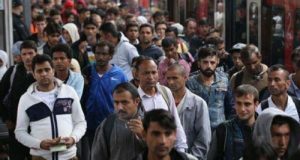 That policy has since been abandoned after it nearly toppled Merkel’s government earlier this year, but the sheer incompetence of German authorities as they struggle to deport criminal migrants continues to inspire awe.